I haven’t written much this week because something horrible happened Monday. We didn’t know it had died for almost 24 hours. We went to bed, woke up in the morning, and the baloney was slimy. And the black beans and broccoli crowns in their little bowls…. Well, let’s not get into the black beans and the broccoli. Weatherwise we started the week on the cool side. Then temps soared into the 90s. We considered our options. 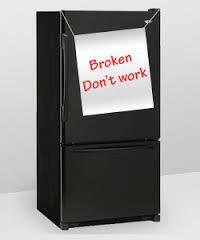 We’ve repaired this refrigerator four times just in the last ten years. Even the repair guy, who has gone to Florida several times thanks to this old fridge, couldn’t recommend that we fix it again when he came again last May. We knew we had to buy a new one and we knew it had to fit in the cut-out made in the cabinets for the old one, back when we did this kitchen over in the late 1980s. Which meant it had to be by the same manufacturer. And the cost of the new model is like four times the money my family spent to send me to college back in my era which was the Woodstock era..
Plus, it might not fit. We measured and talked to the salesmen, measured and talked and it looks like the old fridge, though the same brand as this new one, is half an inch taller. Which means when the guys come in a few minutes, it really might NOT fit. Plus it’s so old, its hookups might not match: the places where the electrical cord goes and also the water source that makes those clunky half moons of ice for you. So, they may just have to leave it in the middle of the kitchen floor until we can also call a plumber, a carpenter, and electrician. Unless Dave can act in all those capacities, which he probably can. Sigh. Tell ya what, nothing is easy. I better stop now and go look our front for them. They’ll need face masks I’m pretty sure, and maybe some of that highly mentholated stuff for putting under their noses. Oh dear. Benn there. I had an older home when I bought the biggest side by side I could find. Kids were still at home and ref. was never big enough. Brought the new one in and well…… They had to leave it in the middle of the room. Was too tall and too wide. With time and cabinet repairs it finally fit. My son has the jewel in his garage now for “extras”… You are sure right nothing is easy anymore. I bought a new washer about a year ago. I HATE it! You cannot wash clothes in four inches of water. I bought the top load HE. Should have bought the front load so I could not ser how much water the machines really do not use. Hard to adjust to the NEW out there these days. Good Luck with you fridge……. BTW, we had the same cubby problem for our replacement fridge and it worked out well (except we didn’t have an ice maker – one more thing to break). In measuring for the new unit, we were very conservative, because they vent out the back and the hot air comes out top and sides. The more space for the hot air to escape, the less energy is needed to keep the fridge cool. If the cubby fits like a glove, it will keep the insides warm, just like a glove. Anyway, that’s my story and I’m stickin’ to it. T, Mark is a finish carpenter and the cabinets can be fixed to adjust for the new fridge..we are off to Disney and he gets home next Sunday…He has tools and can travel. such a nice offer but the problem has changed its shape.. See the NEXT blog entry and… have a great time at Disney!